Congratulations Gideon Haigh | The International Cricket Hall of Fame. Gideon Haigh’s acclaimed biography ‘On Warne’ has won the 2013 Cricket Society and MCC Book of the Year Award at Lord’s. More than a plain life story, in On Warne Haigh offers a brilliant portrait of ‘Warnie’s’ craft, an analysis of his career through the lens of his key relationships and biggest misdemeanours, and a personalised portrait of the man as he evolved from the pizza-scoffing prodigy! Writer Gideon Haigh was awarded a £3,000 prize, accepted by published Simon and Schuster’s Ian Marshall at a Long Room dinner, attended by Members of MCC and the Cricket Society as well as guest journalists and writers. Prominent clergyman and former first class cricketer Andrew Wingfield Digby presented the prize and spoke about his cricketing memories in a keynote speech. Other authors shortlisted included former Glamorgan and England batsman turned journalist Steve James and comedian Miles Jupp. Peter Gibbs, Andrew Murtagh and Malcolm Knox made up the six book shortlist. The competition, run by The Cricket Society since 1970 and in partnership with MCC since 2009, is for books nominated by Members and not publishers and is highly regarded by writers and publishers. Haigh previously won the award in 2000 for Mystery Spinner: The Story of Jack Iverson, which was first published in Australia by Text in 1999. 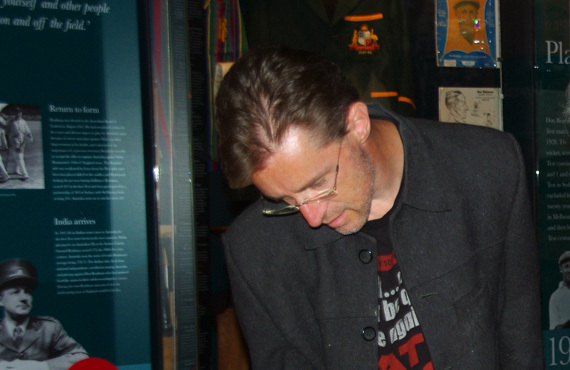 Gideon Haigh is a member of the Bradman Museum reference panel. The reference panel of the museum provides advice, guidance and feedback as to the contents of the Museum. Gideon has been a member for several years. His input as a journalist, author and cricket tragic is invaluable. Congratulations Gideon on another book well written!